You can boil the perfect egg every time. Place one dozen eggs in a large stock pot and cover with cold water and a pinch of salt. Salt will protect the shell by helping to hold it together in case it accidentally cracks during the cooking process. Bring the water up to a boil and promptly turn the burner off, cover with a tight lid and allow the eggs to sit for 15 minutes in the hot bath. This is traditionally served in the egg whites, you can add the egg white to the yolk mix and serve it in celery boats. Peel, rinse and mash (using a potato masher or fork) boiled eggs. 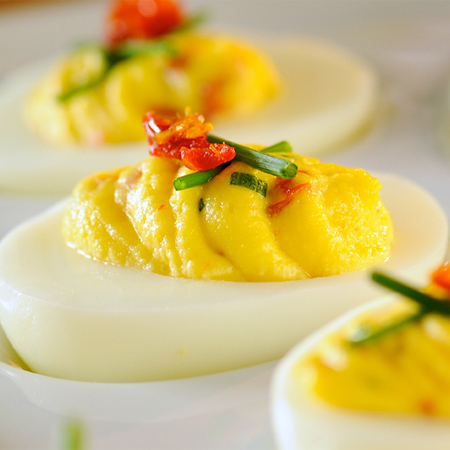 If making as deviled eggs, peel rinse slice in half and scoop out yolk to mash. Place ham on a microwave safe plate and microwave for 2-3 minutes, until cooked. Cooking time vary so watch carefully, prosciutto ham is very thin and cooks quickly. In a large bowl, mix the mashed eggs, ham, mayo, mustard, dill pickles, coriander and fresh pepper. Mix well with a potato masher or a large fork until everything is integrated. If you find this mixture dry, add 1 tsp at a time juice from the pickle jar until desired texture. Fill the empty egg whites with filling. Place into 3-4 in long celery boats. * To keep eggs from sliding around a serving plate, place each one in a miniature paper muffin cup. This entry was posted in Holiday, Modified Profast (Fast and Flexible) Recipes, Nutriplus Recipes (Balance Your Pyramid), Party & Entertaining, Salad and tagged easter, eggs, ham, holiday. party, Metabolic Medical Center Recipes, Salad by foodies4mmc. Bookmark the permalink.